By John F. McKenna (McJack): British and Commonwealth heavyweight champion Tyson Fury (16-0, 11 KO’s) will face Canadian heavyweight champion Neven Pajkic (16-0, 5 KO’s) on Saturday night at Event City, Trafford Park in Manchester, England. The fight will be aired live on channel 5 in the UK. Fury and Pajkic, have had an ongoing grudge with each other for the last several weeks, and Tyson was asked to explain how the grudge got started by Boxing Ireland.com. “I was over there (in Canada) and I was having a bit of a laugh at ringside (during Pajkic’s points win over Johnnie White) and he took it all serious. Fury is particularly irked by Pajkic’s alleged remarks about his father “Gypsy” John Fury who is currently serving time in jail and about his wife Paris. Although Fury is confident of defeating Pajkic on Saturday night he is realistic enough to realize that anything can happen when two heavyweights step into the ring for combat. Fury will go into his fight with Pajkic with a new trainer, having dropped his uncle Hughie Fury and taking on the services of Jamaican born Canadian Chris Johnson. Tyson worked previously with Johnson in Canada and felt he had a close working relationship with the former Commonwealth gold medalist and WBF light heavyweight champion. Fury explained that he made the change in trainers because his working with his uncle was starting to cause problems within the Fury family and he wanted to preserve family unity at all cost. Tyson insists that there is no bad blood between his uncle and him. Fury stated that his uncle refused to accept any money for training him so he believes the move will be good for him as well. Tyson believes that he will be the heavyweight champion of the world inside of 18 months. He believes he will win his championship from undefeated WBA champion Alexander Povetkin (22-0, 15 KO’s) after which he will take on one of the Klitschko’s. 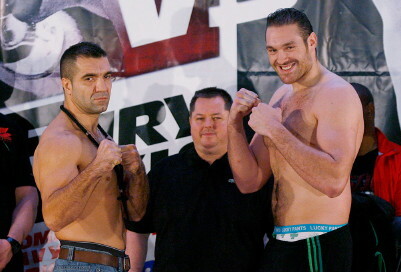 At today’s weigh in the 6’9” Fury came in at 257 pounds, while Pajkic at 6’1” weighed in at 232 pounds. Hopefully the acquisition of chris Johnson as his trainer will eventually help Fury who at times has appeared clumsy and has struggled with getting into optimum fighting condition. While his size will help him against 2nd tier opposition he will undoubtedly have problems as he moves up in the heavyweight rankings.